So often we the dancing public, the parents, teachers and dancers see the names of the "Champions of Cowal" listed as the winners of a particular year. In some cases we see those names listed more than once and as in the case of the dancer profiled here you will also find his mother and brother amongst the elite of Cowal. Gareth Mitchelson has graciously agreed to an interview this month. "I started highland dancing when I was about six years old although I believe that I was introduced to it at a younger age. My mother, Wilma Tolmie, competed regularly at the Highland Games until I was about seven or eight years old, and I was taken to the games each week to sit beside the dancing platform while she competed. This continual exposure to dancing together with being around her dancing classes must have sparked some interest and so I started to dance. I do not recall dancing at such an early age and my earliest memories are from when I was 9 or 10. At that time I took lessons from Mary Neil of Whitburn, in addition to those from my mother. My dancing success varied throughout my years. I won my pre-championship when I was 9 or 10 and my first championship the following year. Within a short period of time I had acquired an area confined title, a boys confined title and then an open Championship. Then, for some unknown reason, my success in competition started to slide and I entered a low period which lasted for several years. I do not know why it started or why it ended, although I suspect that it may have had something to do with trying to catch up with my brother, Deryck, who was winning competitions and trophies every week. Can you try too hard? My competitive career seemed to pick up when I was fifteen. At this time I took great pride in reaching finals at the World Championships at Cowal Games, even though I did not figure in the first six places. However, my competitive attitude was rekindled along with the drive to win. At sixteen, I was placed in the World Championships at Cowal and when I was 17, I was runner-up, this being the ultimate catalyst in reinforcing my goal to win the Worlds Championship Title. And so I won the Adult World Championship in 1985 when I was 18, lost it on a tie in 1986, then won it 1987, 1988 and 1989. After this, although I did compete at various highland games, I did not reappear at many Championships. Q.	Yesteryear found the Highland platforms with the male dancer in the majority, however today, that is not the case. Worldwide, no matter the organization, the male dancer is totally outnumbered. Why do you think that is the case? And what do you think can be done to build back the number of male dancers in Highland? Gareth: I suppose it depends upon how far back you go for your statistical evidence. Yes, I understand that up till the turn of the nineteenth century, highland dancing was a male preserve, but a typical contest may have attracted around sixteen to twenty dancers. However, after the war ended, great social advances were made especially in the emancipation of women, and the girls were suddenly able to participate in all manner of activities that previously were not "ladylike". So that there was a surge in those taking part in competition, mostly outdoors in these days, and before long females were dominating the scene. Today, in most forms of dance the female is in the majority and Highland Dancing is no different. The number of male competitors has seen fair variations through recent years throughout the years. Certainly around the mid-sixties, there were twelve to sixteen adult males regularly competing, particularly in the North East. But certainly in recent years, the numbers have been very disappointing. When I was competing in Boys Championships, there were regularly more than twelve in the group. This was important since these boys would eventually swell the numbers of adult males. In fact, my mother usually had around ten boys in the dancing class, and this in itself was an encouragement for other boys to join. The average age of competitors has dropped substantially over the years - from the days when my mother competed and most dancers were over twenty years old, to the present day when most dancers are less than sixteen. Could this be a factor? Do males feel swamped by the sheer numbers of small girls around, and of course the numbers taking part today are far higher than yesteryear, with the inclusion of grades, and national dances, many of which I feel are female in form. The image of highland dancing has also changed along with this drop in ages. Highland dancing is no longer seen by the general public as a mixture of art and culture, combining strength with grace, with the image of the 'highlander' but is instead replaced by sweet, cute wee girls giving displays in church halls! This certainly is not very encouraging for males! Another factor may have been the gradual dropping of male only events at Highland Games. In the mid-eighties, campaigners put pressure on organisers particularly in the North East to eliminate male only contests. There were no female contests. However, the result was that instead of extending their programme to include female events, as in any other "sport", games organisers, by and large, abandoned male highland dancing events, and replaced the contests by common gender events. How do we turn the tide? 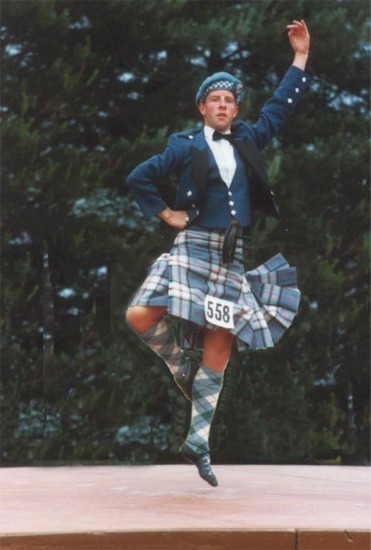 In order to encourage more males to participate in Highland Dancing I feel that its image much change. Steps should be taken to promote traditions, representing strength, dexterity, and passion and present this image to the general public. Dancers from the armed forces come to mind, the pictures we see of teams of males from the Scottish regiments dancing reels and broadswords? It looks so powerful and impressive. In addition, organisers could be encouraged to re-introduce male only events, side by side if need be, with female events. More of our adverts should show male dancers taking part, instead of as usual, some sweet, smiling girl. Q. Is there a plus side to being a male dancer, and if so what, and also is there a minus side if so what? Q. The male dancer has to put up with stereotypical remarks.etc especially in the teen years, it seems the male dancer around the formative teen years seemingly goes into other activities. What would you say to the dancer to keep them from leaving the platform? Gareth: My advice is 'if you enjoy dancing then keep dancing'. I was very fortunate when I was growing up in as far as I was never teased about my dancing by my peers. I did not hide my dancing activities from my friends and so they had no opportunity to chance upon or 'discover my secret'. They quickly became aware of my potential to win more money by competing at competitions and games for a few hours than by working at part time jobs all week, and of the offers of overseas dancing trips. I always felt that rather than being amused by my dancing and teasing me about it, many of my friends were in fact rather envious! Q. You are from a dancing family mother, Cowal Champion and your brother holding the silverware on numerous occasions. Do you think, as a male dancer, having the support of a dancing family helped to keep the focus on dancing? Gareth: Being part of a dancing family certainly helped me focus on dancing. My brother, sister and I competed against each other for many years - sometimes at competitions, but always at every dancing class. I should mention my sister, Ailsa, perhaps lesser known overseas than Deryck and I, was one of the top dancers in Scotland, winner of numerous Championships, second in the Junior World Championship. Most weekends would see us pitted against each other, sometimes two, sometimes three, and usually one of us managing to take home the trophy. My family's involvement in dancing certainly helped me to maintain a focus on my own dancing. We were always there for each other and when one was having a bad day more often than not another was having a good day and so we were always successful. This was a great help and also a great motivational factor, as you did not want to be the one doing badly! I certainly was pushed along in particular by the extent of Deryck's competitive success. I was not jealous of him, but at the same time did not want to be outdone by him. We had a friendly rivalry whereby we were constantly trying to better each other, and at the same time when we were competing against each other, we were trying to better everyone else. Q.What would you say was your most exciting moment in your dancing career? Gareth: There were several 'most exciting' moments in my dancing career, each one being at a different stage of my development. Winning my pre-championship was a major moment - better than anything that had come before. So then was winning my first Confined Championship, my first Boys Championship, then the Open championship. However, the climax of my competitive career, was undoubtedly winning the World Championship for the first time, a moment made even better because my brother won the Junior World Championship the same day. Q.You are now an SOBHD adjudicator; numerous Cowal Champions entered the world of professional dance. Are you involved with any other dance forms besides Highland? Is your profession dance related? Gareth: I dance professionally, although not for a living at events both home and overseas. I am a Chartered Accountant by profession and am currently employed as financial controller for a Biotech company in Tayside. My main focus within dance is definitely Highland, although I am involved to a small degree in other forms, including Scottish step dancing, Scottish Country dancing and tap! Q. If you could talk to one of the "great" past dancing masters of the last century, who would it be? And what would you ask him? Gareth: Possibly William MacLennan. I have snatches of JL MacKenzie and Bobby Watson on video, but Maclennan died at the end of the nineteenth century before the box was invented. His style of dancing was reputed to be truly "highland", graceful, natural and without affectation, many of the attributes that I personally admire. I have a great interest in the history behind this great culture of ours, and would like to see his style and pick his brains. Q. Did you have any one person who you looked up to as a young boy dancing? Who and Why? Gareth: No! As a young lad, I did not really concentrate much on competing and winning. You may say that I came of age, started to set personal goal in terms of my dancing career at around fifteen or sixteen, and it was then that I make the conscientious decision to put more effort into dance. Q. You are now a father, will your children do you think continue the dynasty and eventually grace the platforms? Gareth: I do suspect that my daughters will eventually start to dance, for the same reasons as I did. They see me dance and practise, they are familiar with the bagpipes, they have been along to the occasional competition and in time Donna, my wife, will no doubt take them with her to her dancing classes. Donna and I will be more than delighted if they dance, but certainly will not force them to continue against their will. If either or both decide not to dance then we will support them in whatever activity they chose to pursue (although I may say in honesty that I would be a little disappointed). Q. What do you think needs to happen in order to get "Highland/Scottish dance performances (other than competitive) into the "mainstream". Michael Flatly obviously gets the credit for bringing Irish dance into the mainstream do you think there maybe a Scottish Michael Flatly out there? Why do you think the dances of Scotland haven't enjoyed the same success with "non educated in all things Scottish audiences" as have other national dance forms i.e. in the US especially the Russian and Polish have great followings. Gareth: This is a good question. I have often wondered this myself. Some years back I was involved with a group of individuals, including art critics, dancers, choreographers and well-known Scottish band. The aim was to attempt to initiate and present some kind of high impact Scottish show. The project faltered on many fronts, although all without specific reason. The Scots are a pretty introverted race and are "NOT" good at 'sounding their own trumpet'. I know that the various forms of Scottish Dancing and music lend themselves well to spectacular high impact performances but our nature seems to prohibit this. I think that one essential ingredient for such a show would be some sort of national funding and training scheme, perhaps similar to that of Scottish Ballet and Scottish Opera. I find it strange that these arts are funded nationally but more traditional Scottish arts (dance and music) are left to small, self-financing, locally situated groups. Without such a scheme an individual would have to be prepared to sacrifice a considerable period of time to what may turn out to be an unsuccessful project. Just think of the time required for meetings, rehearsals, performances and tours. This is not compatible with a career out with dancing. Some dancers I know might be prepared to give up, say, one year before or after University, but would still require funding. It is not the lack of talent that prevents Scotland creating its own spectacular but our nature. Scots are their own worst critics. Q. There are a number of dance related injuries occurring in young dancers especially in N. America, however that doesn't seem to be the case in Scotland, Why do you think that is? Gareth: I cannot provide a definitive explanation for the high number of dance related injuries in North America compared with Scotland. However, my own thoughts, from personal experience, are that we in Scotland get less caught up with the technical names and causes of injuries and just get on with dancing - if your leg aches, you ease up a bit, hope that it recovers and then get back to normal. We tend to fight through the pain barrier, and I can already feel the grimaces from the various specialists dealing with sports injuries. Yes, we may be doing damage, but mentally one is attuned to what is a passing ache and what is serious. In the old days they called it grit. Q. In N. America especially we have very young children and their parents/teachers pushing the envelope as an example extension/ split hi-cuts and trying to emulate the Premier or older dancers what are your feeling in that regard? Gareth: Dancers should only perform extended high-cuts when their bodies are able to cope with the stress that they bring. To this extent it is up to the parent to ask the teacher to hold back if they are trying to push the child too quickly and similarly for the teacher to hold the child back until they are properly able to cope. They must realise that pushing too early will only reduce the child's dancing life by causing pain and injury on young developing bones and bodies. I have judged girls in the primary section dancing extended high-cuts in the pas-de-basques and high-cuts and I have to say that it is completely unnecessary at such a young age. If the dancer is so good that they can perform extended reasonable high-cuts in the first place, then I would suggest that they would be good enough to win by dancing non-extended high-cuts. On a personal basis, I would not expect to see dancers performing extended high-cuts until they are ready to progress into the Premier category, and would rather see "controlled" non-extended high-cuts than "wild" extensions. Q. Is there anything not covered in the above questions that you would like to touch upon feel free. My dancing career is not yet over, far from it I hope. It is a wonderful hobby, and I would commend it to anyone. I have been to exciting and exotic places, made friends from around the world, have tasted success and disappointment. Now I am trying to put a bit back into dance through participating workshops, and by membership of various dance committees and look forward to many more enjoyable years to come.